Not to be confused with North American Airlines. Through a series of mergers and sales, North American Aviation became part of North American Rockwell, which later became Rockwell International and is now part of Boeing. General Motors Corporation took a controlling interest in NAA and merged it with its general aviation division in 1933, but retained the name North American Aviation. Kindelberger moved the company's operations from Dundalk, Maryland to Los Angeles, California, which allowed flying year-round, and decided to focus on training aircraft, on the theory that it would be easier than trying to compete with established companies on larger projects. Its first planes were the GA-15 observation plane and the GA-16 trainer, followed by the O-47 and BT-9, also called the GA-16. The BC-1 of 1937 was North American's first combat aircraft; it was based on the GA-16. In 1940, like other manufacturers, North American started gearing up for war, opening factories in Columbus, Ohio, Dallas, Texas, and Kansas City, Kansas. North American ranked eleventh among United States corporations in the value of wartime production contracts. 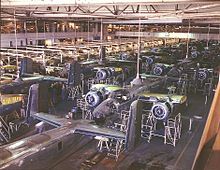 B-25 Mitchell bomber production line at the North American Aviation plant, Inglewood, California, October 1942. The plane's outer wings have yet to be added, which enables the two side-by-side assembly lines to be closer together. The outer wings will be attached outdoors, in the "sunshine" assembly line. North American's follow-on to the BT-9 was the T-6 Texan trainer, of which 17,000 were built, making it the most widely used trainer ever. The twin-engine B-25 Mitchell bomber achieved fame in the Doolittle Raid and was used in all combat theaters of operation. 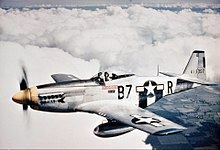 The P-51 Mustang was initially produced for Britain as an alternative to the Curtiss P-40 Warhawk, which North American had declined to produce under licence. The derivative A-36 Apache was developed as a ground attack aircraft and dive bomber. This was done, in part, to keep the airframe in production as the US Army Air Corps had not yet decided to purchase the type as a fighter. A suggestion by the RAF that North American switch the P-51's powerplant from its original Allison engine to the Rolls-Royce Merlin engine may have been one of the most significant events in World War II aviation, as it transformed the P-51 into what many consider to be the best American fighter of the war. Post-war, North American's employment dropped from a high of 91,000 to 5,000 in 1946. On V-J Day, North American had orders from the U.S. government for 8,000 aircraft. A few months later, that had dropped to 24. Two years later in 1948, General Motors divested NAA as a public company. 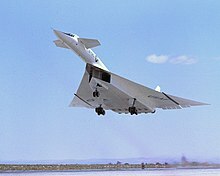 Nevertheless, NAA continued with new designs, including the T-28 Trojan trainer and attack aircraft, the odd-looking F-82 Twin Mustang, B-45 Tornado jet bomber, the FJ Fury fighter, AJ Savage, the revolutionary XB-70 Valkyrie Mach-3 strategic bomber, Shrike Commander, and T-39 Sabreliner business jet. The Columbus, Ohio division of North American Aviation was instrumental in the exclusive development and production of the A-5 Vigilante, an advanced high speed bomber that would see significant use as a naval reconnaissance aircraft during the Vietnam War, the OV-10 Bronco, the first aircraft specifically designed for forward air control (FAC), and counter-insurgency (COIN) duties, and the T-2 Buckeye Naval trainer, which would serve from the late 1950s until 2008 and be flown in training by virtually every Naval Aviator and Naval Flight Officer in the US Navy and US Marine Corps for four decades. The Buckeye's name would be an acknowledgment to the state tree of Ohio, as well as the mascot of Ohio State University. The North American F-86 Sabre started out as a redesigned Fury and achieved fame shooting down MiGs in the Korean War. Over 9,000 F-86s were produced. Its successor, the North American F-100 Super Sabre, was also popular. The cancellation of the F-107 and F-108 programs in the late 1950s, as well as the cancellation of the Navaho intercontinental cruise missile program, was a blow to North American from which it never fully recovered. Atomics International was a division of North American Aviation which began as the Atomic Energy Research Department at the Downey plant in 1948. In 1955, the department was renamed Atomics International and engaged principally in the early development of nuclear technology and nuclear reactors for both commercial and government applications. Atomics International was responsible for a number of accomplishments relating to nuclear energy: design, construction and operation of the first nuclear reactor in California (a small aqueous homogeneous reactor located at the NAA Downey plant), the first nuclear reactor to produce power for a commercial power grid in the United States (the Sodium Reactor Experiment located at the Santa Susana Field Laboratory) and the first nuclear reactor launched into outer space by the United States (the SNAP-10A). As overall interest in nuclear power declined, Atomics International transitioned to non-nuclear energy-related projects such as coal gasification and gradually ceased designing and testing nuclear reactors. Atomics International was eventually merged with the Rocketdyne division in 1978. Autonetics began in 1945 at North American's Technical Research Laboratory, a small unit in the Los Angeles Division's engineering department based in Downey, California. The evolution of the Navaho missile program resulted in the establishment of Autonetics as a separate division of North American Aviation in 1955, first located in Downey, later moving to Anaheim, California in 1963. The division was involved in the development of guidance systems for the Minuteman ballistic missile system. In 1955, the rocket engine operations were spun off into a separate division as Rocketdyne. 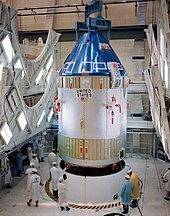 This division furnished engines for the Redstone, Jupiter, Thor, Delta, and Atlas missiles, and for NASA's Saturn family of launch vehicles. North American designed and built the airframe for the X-15, a rocket-powered aircraft that first flew in 1959. In 1959, North American built the first of several Little Joe boosters used to test the launch escape system for the Project Mercury spacecraft. In 1960, the new CEO Lee Atwood decided to focus on the space program, and the company became the prime contractor for the Apollo command and service module, a larger Little Joe II rocket to test Apollo's launch escape system, and the S-II second stage of the Saturn V.
The fatal Apollo 1 fire in January 1967 was partly blamed on the company. In March, it merged with Rockwell-Standard, and the merged company became known as North American Rockwell. Within two years the new company was studying concepts for the Space Shuttle, and won the orbiter contract in 1972. In 1973, the company changed its name again to Rockwell International and named its aircraft division North American Aircraft Operations. Rockwell International's defense and space divisions (including the North American Aviation divisions Autonetics and Rocketdyne) were sold to Boeing in December 1996. Initially called Boeing North American, these groups were integrated with Boeing's Defense division. Rocketdyne was eventually sold by Boeing to UTC Pratt & Whitney in 2005. UTC later sold Rocketdyne to Aerojet (GenCorp) in 2013. ^ a b c d e f g Rumerman. Judy. "North American Aviation." United States Centennial of Flight Commission, 2003. ^ Parker 2013, pp. 2, 78–79. ^ Herman 2012, p. 88. ^ Parker 2013, pp. 77, 90–92. ^ Herman 2012, pp. 88, 203. ^ Parker 2013, pp. 77–92. ^ "Radiation survey of the Downey Facility." Archived 2010-05-27 at the Wayback Machine The Boeing Company, March 1, 2001, p. 7. Retrieved: January 1, 2010. ^ "California Nuclear Industry." U.S. Energy Information Agency. ^ Voss, Susan "SNAP Reactor Overview (AFWL-TN-84-14)". U.S. Air Force Weapons Laboratory, Kirtland AFB, New Mexico, August 1984, p. 57. ^ "Santa Susana Field Laboratory Area IV, Historical Site Assessment." Archived 2010-01-28 at the Wayback Machine Sapere and Boeing, May 2005 p. 2–1. Retrieved: January 1, 2010. ^ Heppenheimer, T. A. (1998). The Space Shuttle Decision. NASA. pp. 429–432. Fletcher, David and Doug MacPhail. Harvard! The North American Trainers in Canada. Dundas, Ontario, Canada: DCF Flying Books,1990. ISBN 0-9693825-0-2. Pattillo, Donald M. Pushing the Envelope: The American Aircraft Industry. Ann Arbor, Michigan: The University of Michigan Press, 1998. ACME, NAA history: documents and photographs archive. Bright, Charles D., The Jet Makers: The Aerospace Industry From 1945 to 1972, Lawrence, Kansas: The Regents Press of Kansas, 1978.